Q: What made you want to start diving? A: (laughs) So, my grandparents had a pool at their house, and they have one of those little short boards. My uncles would come over and say, “Hey, I will give you ‘x’ amount of dollars if you can do however many somersaults off that diving board.” Little 7-year-old me was thrilled to earn a couple of bucks! That’s how it started. So when middle school came around, I went straight to diving. Q: So you’ve been diving for a long time! Were you any good back then? A: I would say I was better than most. I had the body awareness for it, which it requires. I had really good balance too, so that helped a lot. I also wasn’t ever really scared to do much, probably until the past couple of years. I’ve always been kind of an adrenaline junkie. I think that’s why I’ve been interested in the sport for so long. Doing those scary dives…it’s such a rush. That feeling really doesn’t go away. Q: Was there something specific that happened that caused the fear you mentioned feeling these past couple of years? A: I hit my head on the diving board my sophomore year during zones, which is this meet that’s coming up, and I had to get 12 staples in my head. The next year, I studied abroad during the fall semester in a town called Maynooth, Ireland. I dove when I got back, but I was pretty timid. That was the longest time I had been without diving. The confidence wasn’t there, so I wasn’t able to perform as well as I could have. 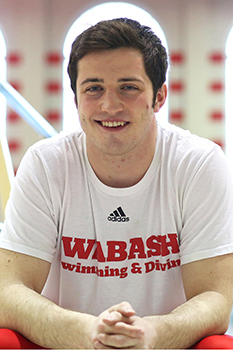 Q: Now here you are, NCAC Diver of the Year, and you won the 3-meter competition at the conference championships. How does that feel? A: I knew it was going to be tough because Kenyon has a diver that’s right at my level. What we didn’t expect was for Denison to have a freshman who was also in the mix. I really felt like I earned it, but I also want to stay focused on zones this weekend. I want to take that same energy I had on the 3-meter board and carry it over for all of Friday and Saturday. I just need to stay relaxed. Dive my dives. 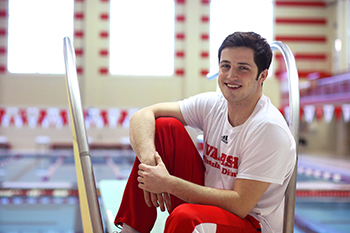 Q: Outside of your diving accomplishments, what would you consider to be your favorite Wabash memory? A: Chapel Sing. Just that whole process. Going to practice. I met a lot of people through that, including some of my best friends. Being up there in front of everybody…I like the spotlight, so I really enjoyed that. Q: Now you’re a Sphinx Club member, so what’s it like to be on the other side? A: (laughs) I’ve gotten somebody to mess up—that was a very proud moment. When he started a new verse, I started singing the other verse. That’s what I usually do. So satisfying. But I remember he did get the “W.” He went into the Chapel and was fine, but I did get him. Q: What’s something you’ve done during your time here that pushed you out of your comfort zone? A: I was an actor in one of the Scarlet Masque plays. The theater was something I had always been interested in doing, but they dedicate so much time that it just wasn’t possible with me diving. Scarlet Masque allowed me to dip my feet in the water. It was so much fun. I loved it. Again, I love the spotlight! Q: So then you probably love that all eyes are on you on the diving board! Q: But what if the dive doesn’t go well? A: I do a really good job of coming out of the water with a big smile on my face. (laughs) I’ll hear the big “Ooooo” comes from the crowd, so I ham it up a little bit—but not too much—waving, making sure the crowd knows I’m okay. Q: Earlier, you called yourself an adrenaline junkie. What’s the craziest thing you’ve ever done? A: I went skydiving. I had just turned 18 and me and two of my buddies made plans to go up to Indianapolis and skydive. I told my mom that we were going to go to SkyZone and jump on the trampolines. Well, I didn’t do that. I went and jumped out of a plane! And that was the first time I had ever been on a plane before. But I’ve toned it down since then, so I don’t know if I’d go again. Q: What do you mean you’ve toned it down? A: I’m a very different person now than I was my freshman year. I was wild in high school, but that’s not the norm here. I had to get a lot more serious, and I’ve matured a lot. It’s still there, but it’s waiting for the right time. (laughs) It’s tired. Q: That’s probably a good thing because we heard you’re now coaching diving at Crawfordsville Middle School. What’s that like? A: They are incredibly stubborn, and I know I was the same way. They’re in this stage where most of them will just try things. I’ve learned a lot from critiquing what they do—being able to sit there and watch them dive, see the little mistakes they’re making. I’ve been able to carry that over, and honestly, I think that’s helped me improve a lot. Favorite class you’ve taken at Wabash? I don’t have a uvula! When I was in kindergarten, I would snore a lot and choke on it in my sleep. So they had to cut it out. Poor little kindergarten me. So no more punching bag.